Ward off pests with natural mosquito repellent incense cones. High concentrations of citronella, cedarwood, rosemary, and other oils naturally combat mosquitoes and smell great too. This formula doesn’t contain any DEET or petroleum and the incense is clean-burning, so you can feel good about using it. 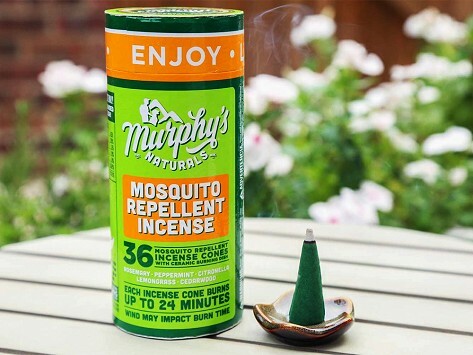 Dimensions: 0.5" x 0.5" x 1.75"
The mosquito repellent incense sticks from Murphy’s Naturals prove that nature has its own way of warding off pests. High concentrations of citronella, rosemary, lemongrass, peppermint, and cedarwood oils protect your space from mosquitoes without using DEET or petroleum. And this natural blend of oils smells great, too. The incense can give you a 12-foot radius of protection for up to two and a half hours. The sizable sticks are perfect to use on the patio, deck, or porch. The Freeman family is behind this B-Corp company named after their dog, Murphy. The Freeman's are committed to responsibly sourcing plant-based ingredients and creating repellents that help protect families—not harm them. And because their incense is clean-burning, you don’t have to worry about burning it around yours.